Home » A Chinese Mandarin. 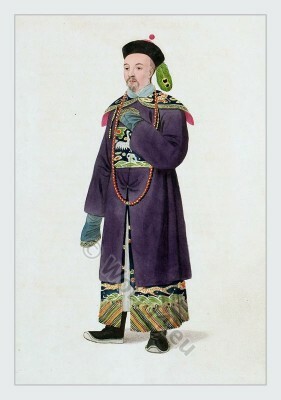 Historical Chinese costume in 1799. A Mandarin of distinction in his habit of ceremony. THE dress of a Chinese is suited to the gravity of his demeanor. It consists, in general, of a long vest extending to the ankle: the sleeves are wide at the shoulder, are gradually narrower at the wrist, and are rounded off in the form of a horse-shoe, covering the whole hand when it is not lifted up. No man of rank is allowed to appear in public without boots which have no heels, and are made of satin, silk, or calico. In full dress he wears a long silk gown, generally of a blue color and heavily embroidered; over this is placed a fur-coat of silk, which reaches to the hand and descends below the knee. From his neck is suspended a string of costly coral beads. His cap is edged with satin, velvet, or fur, and on the crown is a red ball with a peacock’s feather hanging from it. These are badges of distinction conferred by the emperor. The embroidered bird upon the breast is worn only by mandarins high in civil rank, while the military mandarins are distinguished by an embroidered dragon. All colors are not suffered to be worn indiscriminately. The emperor, and the princes of the blood only, are allowed to wear yellow; although violet color is sometimes chosen by mandarins of rank on days of ceremony. The common people seldom wear any other than blue or black, and white is universally adopted for mourning. – In their dispositions the Chinese are mild and humane, carefully avoiding every word or gesture which may betray either anger or any violent emotion of the mind. They entertain the highest reverence for their parents, and respect for the aged. They are enthusiastic admirers of virtue, and venerate the memory of such of their nation as have been celebrated for a love of justice and of their country. With this singular people neither riches nor birth can establish the smallest claim to honors. Personal merit is the soIe basis upon which any man can raise himself to distinguished rank. Talents and virtue are indispensably requisite for those in power, and where they are deficient, every adventitious or hereditary pretension is totally disallowed. This entry was posted in 1799, 18th Century, Asia, China, Court dress, Traditional and tagged Traditional Chinese costumes, Traditional Chinese Mens Dress on 3/18/13 by world4.